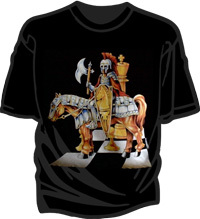 The noble "knight" sits on his horse and protects his king from danger. This T-shirt will give you the confidence you need to take on any opponent! Made from a 50% blend of polyester and cotton, this shirt won't shrink very much or wrinkle when machine dried. Available in all sizes, from children's small up to adult 6XL!